How to order / purchase a medieval sword? When we know the type and period, you can specify particular originalm example to be recreated or some few as the base for the design. I always make design in scale 1:1 and working with this to the final effect. When work is finished - I`m sending high quality photos and measurements. When I have the customer agreement - then I prepare the shipping. Every sword, scabbard or axe is hand-made object with unique form, just like medieval pieces. I use both: old and modern technology, but always most important is the final effect: medieval character, appearance and features. Mostly I use high-carbon, chrom-vanadium steel for blades, forging and grinding, without computer-controlled machines. Hardening process can be controlled for best results, close to medieval blades hardness. As all hand crafted things swords and scabbards can have visible traces of manual work after forging, grinding, coloring, etc. The waiting time depends on curent queue. Usually it is from 4 to 12 months. I prefer PayPal for the payment. I will ask for some advance on start, simply to confirm the commission. It may be from 20 to 50% of full amount. There is a section Available where I place some finished works. They are for sale. You can ask me about customizing them, adding some decorations, etc. 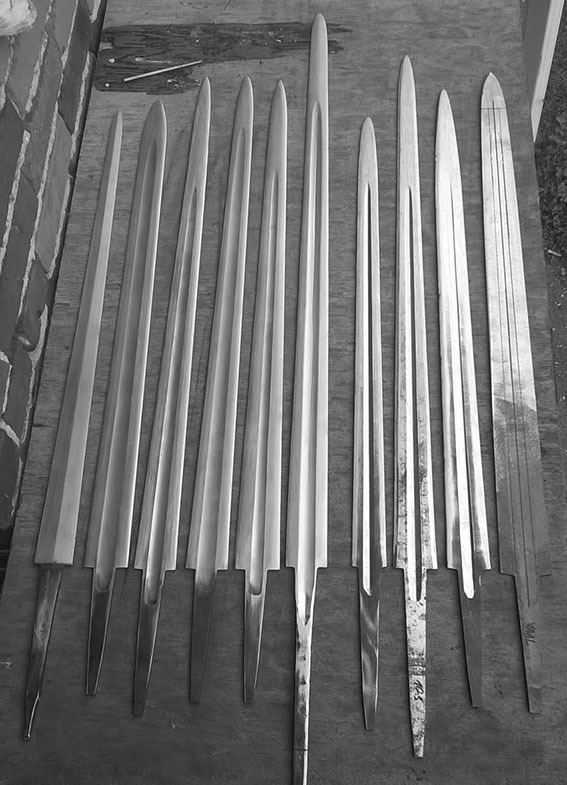 They are finished my way, mostly unsharpened or close to sharp, because of the safety of finishing work but also because some of you don`t want it very sharp (for fencing for example). You need to contact me and discuss - there are very different expectations and these pieces are not commissioned ones. As all hand crafted things swords and scabbards can have visible traces of manual work after forging, grinding, coloring, etc. Purchasing one of available swords means acceptance of the finish form shown in the pictures and description. All works are hand made according to available research and historical sources and can reflects some imperfections found on historical examples. I use Official Post Office for international shipping, the air-post. Cost of the shipping is mostly ca. 50 € for European countries and ca. $60 for others. I`m using a sturdy boxes, cutted to the particular object and 4 protection layers inside or solid ABS cases. The object is always secured and safe. After the shipping is started I will send to the customer a tracking code with a link. Shipping time should be 2-4 weeks, depends on the country, distance and shipping method. 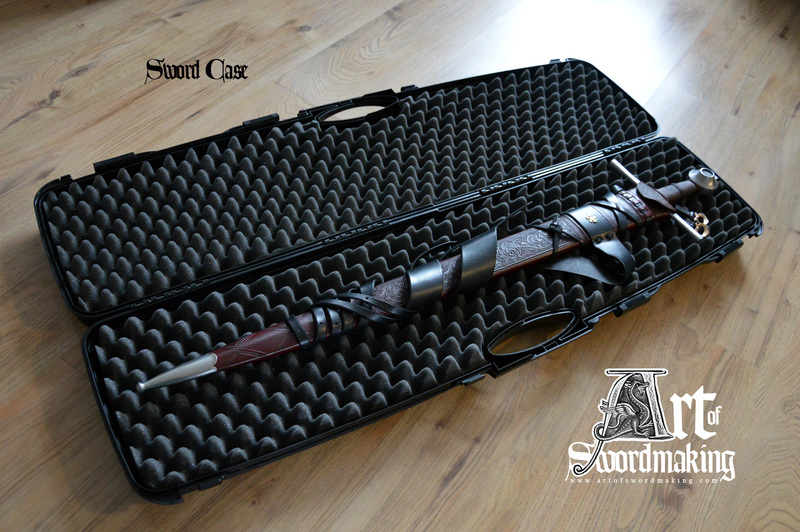 Some special swords can be shipped with a case, for safety and comfort of using. Ask me for this option before shipping. You can send me your opinion, if you want - or prepare and publish your review about my work. If you have in plans to make a review, let me know about that and I can send you some better quality pictures - or make special ones before shipping. There is very difficult to make a 'price list' if we are talking about such unique hand-made objects, like medieval swords or axes. I prefer to calculate particular commission by all informations I can gather before work, with all historical aspects and customer expectations. The price depends on many things, like: type, parameters, aging, inscriptions, decorations, scabbard and belt, etc. You can contact me and describe what you wish to have and I will answer with price.